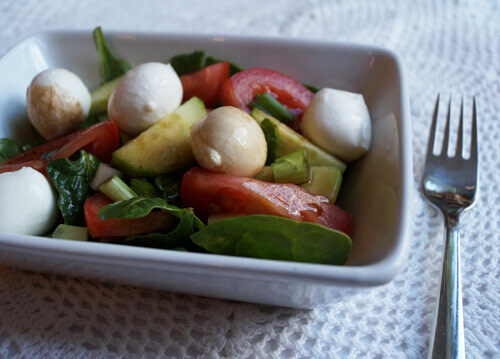 This salad combines fresh seasonal vegetables and fresh mozzarella and is delectable and simple to make. It is packed with nutrients and light at the same time and makes for a great holiday salad. A beautiful blend of vegetables, this salad is refreshing and absolutely fantastic. I keep making it again and again and my children love it. Your family and friends are sure to appreciate it and you can keep it in the fridge overnight. It is always a hit at dinners and one of our favorite summer dishes to try. Rinse and cut tomatoes and cucumber in slices and drain Bocconcini balls. You can use any size ball you want to. Rinse and dry spinach and then mince onion. Use a pretty shallow bowl to piece the salad together. Add tomatoes, Bocconcini balls, cucumber, spinach, and onion. Use a small bowl to prepare the dressing. Add balsamic vinegar, olive oil, and salt and pepper if desired. You can also add minced onion for richness of taste and flavor. Stir well to blend and drizzle over the salad. You may also use a jar with a lid for the dressing to combine really well. Toss to combine well, garnish with basil leaves, and serve. To make this salad more colorful and flavorful, you can use a mix of yellow, orange, and red tomatoes of any kind.